(T/F) In the review of the movie, People Magazine incorrectly refers to Dillon as the old sheriff of Dodge City. In what year did Gunsmoke: To the Last Man air? Friday, January 10, 1992. It concerned feuding in the Pleasent Valley Wars of the 1880's. 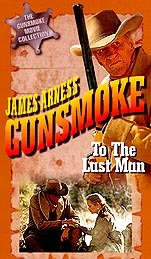 (T/F) Gunsmoke: To the Last Man starts with a prayer. True. Mike is burried and the prayer is at her funeral. She died of a fever. (T/F) The actor, Pat Hingle, replaced Doc in the Gunsmoke series when Milburn Stone had health problems. In Gunsmoke: To the Last Man, Hingle plays a corupt rancher. (T/F) The credits of Gunsmoke: To the Last Man lists James Arness as a consultant. Gunsmoke: To the Last Man is dedicated to John Meston. Which of the following is true. Meston played the young Thad Green during two Gunsmoke seasons. Meston wrote most of the early Gunsmoke radio and television scripts. 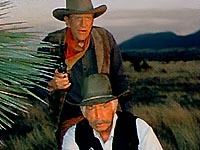 Meston directed many Gunsmoke episodes from the early 1970's until the show was cancelled. Answer: He wrote many of the early Gunsmoke scripts - some of the best.